Highlights: Your evening begins with a short panoramic drive through the city center and at the slope of the sacred hill you will be able to see, admire and take photos of the illuminated Acropolis. 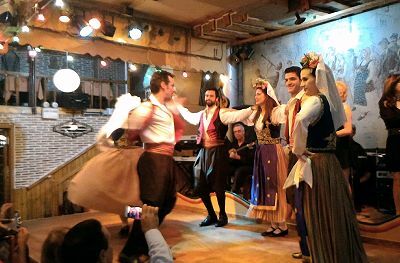 Then a pleasant walk through the narrow picturesque streets of Plaka, the old city, will bring you at a typical Greek tavern where you will enjoy your dinner following a floor show with live music and Greek Folk Dances in traditional costumes. This was the only tour we were not happy with. The lady who was the guide was a little odd. She was rather political and frankly rather insulting. She made several comments that were not kind to all of us from Canada and the states. The restaurant was crowded and silly. We passed a number of restaurants that looked very nice with some really good music but we ended up here with a less than appealing "show" We would not recommend this to our friends. To be fair, Uli did say that the original trip we booked got cancelled for some reason and this was a fall back. I would not suggest working with them again. Loved it! Our tour guide answered all questions, provided detailed information and was very personable. Our driver was very courteous and respectful. Excellent Night out in very comfortable and luxurious MPV, largest I have ever seen!! The show at the restaurant was not very fancy or luxurious but it was very entertaining and the performers went all out to please the audience! Very enjoyable 2 1/2 or 3 hour performance!! The food was also delicious and sumptuous! the "“A night out in Athens”"